So naturally evolutionary astronomers have been conducting experiments to observe the gravitational effects of dark matter. One recent experimental report by Crézé et al. in Astronomy and Astrophysics has concluded that there is no dark matter in the disk of the Milky Way Galaxy.10 This report analyzed the proper motion of stars perpendicular to the galactic disk in a sphere of radius 125 parsecs around the sun. By analysing the distribution of motion for 100 stars, the team was able to analyse the gravitational pull dragging them back towards the galactic disk. In this way, the researchers could deduce the gravitational mass that is ‘practically hypothesis-free and model-free.’11 The experiment has been described as calculating the mass of the Earth from looking at samples of high jumpers and measuring the height they reach.8 They conclude, based essentially on observations, that the local dynamical density is ‘…well below all previous determinations leaving no room for any disk shaped component of dark matter.’11 This report also gives the strong impression that many previous ‘results’ are biased by a model or hypothesis, making one wonder what can really be believed. If the dark matter is not in the Milky Way Galaxy, and by extension other galaxies, that only leaves interstellar space. Perhaps the observations should be interpreted more straightforward, in which case the universe is not nearly as old as astronomers believe. The ‘big bang’ theory would also have to be either abandoned or greatly retooled. Kamionkowski, M., 1998. The case of the curved universe: open, closed or flat. Science 280:1397–98. Return to text. Craig, W.L., 1984. Apologetics: an Introduction, Moody Press, Chicago, Ch. 3. Craig wrote: ‘When I was at the 16th World Congress on Philosophy in DÃ¼sseldorf in 1978, I found that the only scientists who opposed the big-bang theory were Marxists from communist nations,’ p. 91. Return to text. Sarfati, J.D., 1998. If God created the universe, then who created God? CEN Tech. J. 12(1):20–22. Return to text. 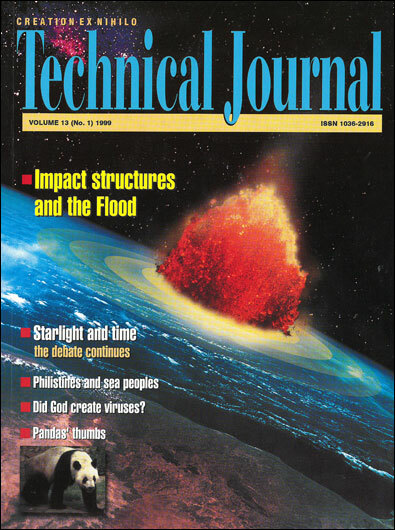 Primack, J.R., 1998. A little hot dark matter matters. Science 280:1398–1400. Return to text. Gawiser, E. and Silk, J., 1998. Extracting primordial density fluctuations. Science 280:1405–1411. Return to text. Glanz, J., 1998. A dark matter candidate loses its luster. Science 281:332–333. Return to text. Tinney, C.G., 1999. Brown dwarfs: the stars that failed. Nature 397(6714):37–40. Return to text. Hellemans, A., 1997. Galactic disk contains no dark matter. Science 278:1230. Return to text. Humphreys and others have pointed out that the Milky Way’s observed rotation rate, regardless of its cause, is so fast that: ‘if our galaxy were more than a few hundred million years old, it would be a featureless smear of stars instead of its present spiral shape.’Humphreys, D.R., 1991. Evidence for a young world . Creation Ex Nihilo 13(3):28–31. Emphasis in original. Return to text. Crézé, M., Chereul, E., Bienaymé, O., and Pichon, C., 1998. The distribution of nearby stars in phase space mapped by Hipparcos. Astronomy and Astrophysics 329:920–936. Return to text. Crézé et al, Ref. 4, p. 920. Return to text. Glanz, Ref. 2, p. 332. Return to text.